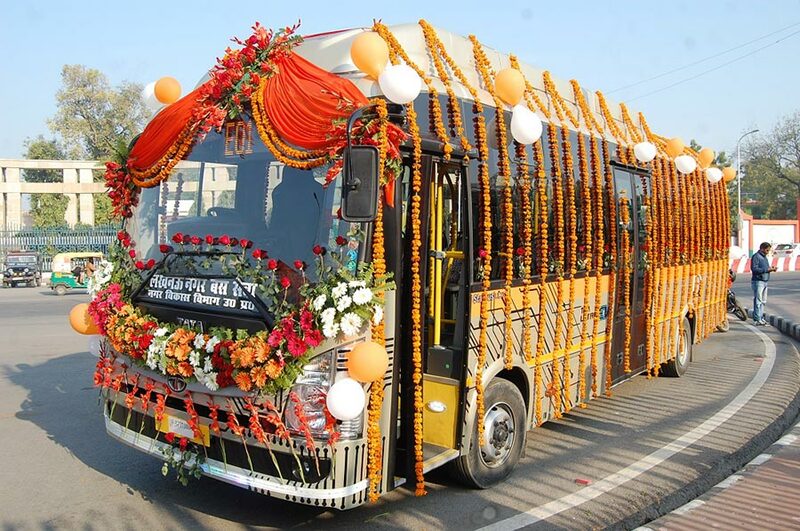 Reaffirming its commitment towards E-mobility in the country, India’s leading bus brand, Tata Motors will be supplying 40 units of the Ultra 9m AC Electric buses to the Lucknow City Transport Services Ltd (LCTSL) in a phased manner, within the next four months. 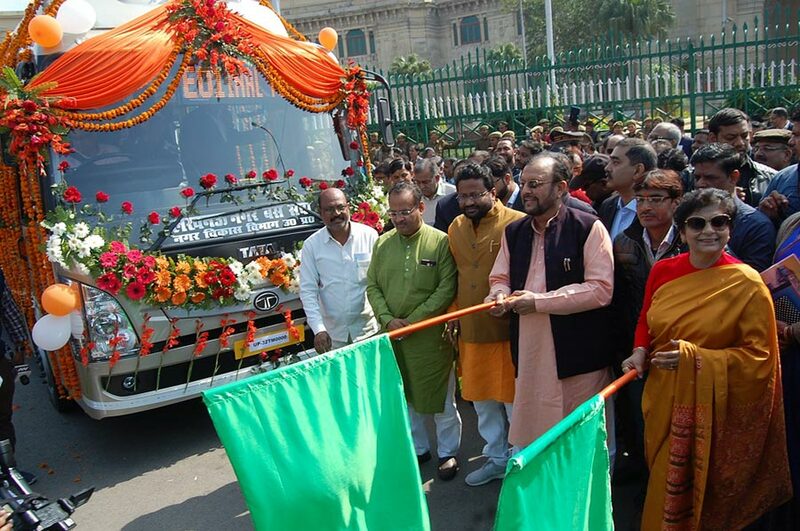 The first Ultra 9/9m AC Electric bus was flagged off today in Lucknow by the Hon’ble Minister of Urban Development, Suresh Kumar Khanna along with dignitaries from LCTSL and Tata Motors. The new bus will begin its journey from Alambagh depot. Tata Motors has always been at the forefront of the E-mobility evolution and this order is a testament of our best-in-class solution tailored for the bus segment in India. The order is part of the 255 e-buses to be supplied to six STUs in the country, of which LCTSL is one. Our in-depth understanding of sustainable public transport for different markets and customers is what differentiates us from our competitors. We are determined to develop alternate fuel technologies and create more energy efficient vehicles supporting government’s efforts for promoting electric vehicles in the country. Manufactured at Tata Motors and Tata Marcopolo Dharwad plants, the Ultra Electric buses will have a traveling range of up to 150 kilometers on a single charge. The company has installed a charging station at the Alambagh depot for fast charging of buses. The indigenously developed vehicle offers superior design with state-of-the-art features. Li-ion batteries have been placed on the rooftop to prevent breakdown due to waterlogging. The batteries are liquid cooled to maintain the temperature within an optimum range and ensure longer life along with better performance in tropical conditions. Tata Motors has been engaging in advanced engineering and development of electric traction system for Hybrid as well as Pure Electric vehicles for over a decade. The Ultra Electric Bus is a new modular platform which has been developed in a very short lead time of less than a year, leveraging the knowledge and experience we have gained and demonstrating our commitment to the Government of India’s National Electric Mobility Mission Plan for Public Transport. The architecture of the platform has been conceived and developed by in-house engineering team of Tata Motors, meeting the requirement of various tenders floated by different state transport undertakings. The exterior has been designed with new brand identity that includes stylized Ultra headlamps and streamlined looks. The vehicle architecture ensures very low energy consumption and low TCO (total cost of operation) apart from being a Zero Emission environment friendly bus. The Ultra Electric buses are air-conditioned, have modern interiors and comfortable seats for 31 passengers. As an industry first, there will be air suspension for both front and rear axles to make travel more comfortable for the commuters. Integrated electric motor generator with a peak power of 333HP can deliver 197HP continuously ensuring effortless driving in congested roads and frequent start stops needing no shifting of gears. The critical electrical traction components have been sourced from internationally known best-in-class suppliers in USA, Germany and China offering proven products. The buses have been tested and validated by Tata Motors across states including Himachal Pradesh, Chandigarh, Assam and Maharashtra to establish performance in diverse terrains. The Government of UP has a clear focus on revolutionizing Transportation with Sustainable, Affordable and Safe Mobility Solutions for the masses. We are elated to collaborate with the pioneers, Tata Motors, to bring to the people of Uttar Pradesh, State-of-the-Art Electric Buses which will transform the Bus Travel Experience with Smarter, Safer Transportation while providing a Cleaner Environment to the residents. With an In-depth understanding of the market, Tata Motors is delivering the Starbus Ultra 9m AC E-Buses which will soon ply on the roads of Lucknow, from Alambagh Bus Terminal to Gomti Nagar Route. We look forward to strengthening this association with Tata Motors to bring Smart City Solutions in future. The company has tenders to supply 255 electric buses to six public transport undertakings including WBTC (West Bengal), LCTSL (Lucknow), AICTSL (Indore), ASTC (Guwahati), J&KSRTC (Jammu) and JCTSL (Jaipur). In addition to this, the company is also working on developing its electric mini-bus segment in the near future.